VRO VRA Notification 2017 in Telangana, TS vro notification 2017 : Telangana State Govt has decided to recruit 1700 posts in Revenue department.CM has ordered to the Chief Secretary Sri S.P. Singh to initiate the VRO VRA and other posts recruitment process immediately. This recruitment process will be organized by the TSPSC, official will release TS vro notification 2017 soon... 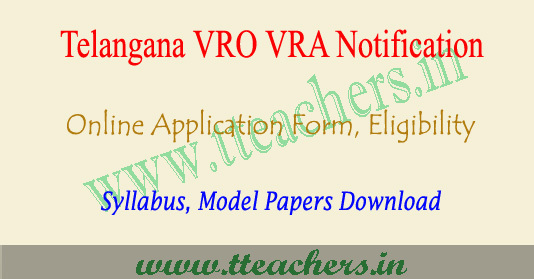 So interested candidates hurry up to know the details of VRO VRA Notification 2017 in Telangana. 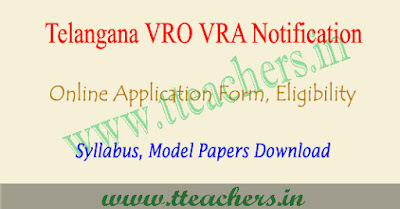 Complete information regarding TS vro notification 2017 will be given through this article like official tspsc vro vra notification 2017, ts vro online application form 2017, apply last date, fee amount, VRO VRA Notification 2017 eligibility criteria, vro vra exam syllabus, model papers, ts vro exam previous papers, ts vro vra exam hall tickets 2017, telangana vro vra official key download, ts vro vra results and selection list available on this website. Government of Telangana is Likely to release TS VRO VRA Notification 2017 very soon So prepare candidates for various other posts related to Revenue Panchayat and Municipal Departments jobs full details is below. Candidates need to first check once eligibility criteria through the official notification which is given by the revenue department If he/she satisfying eligibility criteria then go for apply through online. Educational Qualification: Candidates who want apply to vro and vra posts should have completed intermediate and equivalent qualification for VRO Posts and 10th for VRA Posts from recognized Institute/Board or equivalent. Age Limit: Applicants age should be between 18 years to 36 years for Telangana VRO and VRA Recruitment Notification 2017, age relaxation is applicable as per official organization norms. Adilabad VRO Selection list 2017 : Published soon..
Adilabad VRA Selection list 2017 : Published soon..
Bhadradri (Kothagudem) VRO Selection list 2017 : Published soon..
Bhadradri (Kothagudem) VRA Selection list 2017 : Published soon..
Hyderabad VRO Selection list 2017 : Published soon..
Hyderabad VRA Selection list 2017 : Published soon..
Jagtial VRO Selection list 2017 : Published soon..
Jagtial VRA Selection list 2017 : Published soon..
Jangaon VRO Selection list 2017 : Published soon..
Jangaon VRA Selection list 2017 : Published soon..
Jayashankar Bhupalpalle VRO Selection list 2017 : Published soon..
Jayashankar Bhupalpalle VRA Selection list 2017 : Published soon..
Jogulamba Gadwal VRO Selection list 2017 : Published soon..
Jogulamba Gadwal VRA Selection list 2017 : Published soon..
Kamareddy VRO Selection list 2017 : Published soon..
Kamareddy VRA Selection list 2017 : Published soon..
Karimnagar VRO Selection list 2017 : Published soon..
Karimnagar VRA Selection list 2017 : Published soon..
Khammam VRO Selection list 2017 : Published soon..
Khammam VRA Selection list 2017 : Published soon..
Komaram Bheem VRO Selection list 2017 : Published soon..
Komaram Bheem VRA Selection list 2017 : Published soon..
Mahabubabad VRO Selection list 2017 : Published soon..
Mahabubabad VRA Selection list 2017 : Published soon..
Mahabubnagar VRO Selection list 2017 : Published soon..
Mahabubnagar VRA Selection list 2017 : Published soon..
Mancherial VRO Selection list 2017 : Published soon..
Mancherial VRA Selection list 2017 : Published soon..
Medak VRO Selection list 2017 : Published soon..
Medak VRA Selection list 2017 : Published soon..
Medchal–Malkajgiri VRO Selection list 2017 : Published soon..
Medchal–Malkajgiri VRA Selection list 2017 : Published soon..
Nagarkurnool VRO Selection list 2017 : Published soon..
Nagarkurnool VRA Selection list 2017 : Published soon..
Nalgonda VRA Selection list 2017 : Published soon..
Nirmal VRO Selection list 2017 : Published soon..
Nirmal VRA Selection list 2017 : Published soon..
Nizamabad VRO Selection list 2017 : Published soon..
Nizamabad VRA Selection list 2017 : Published soon..
Peddapalli VRO Selection list 2017 : Published soon..
Peddapalli VRA Selection list 2017 : Published soon..
Rajanna Sircilla VRA Selection list 2017 : Published soon..
Ranga Reddy VRO Selection list 2017 : Published soon..
Ranga Reddy VRA Selection list 2017 : Published soon..
Sangareddy VRA Selection list 2017 : Published soon..
Siddipet VRO Selection list 2017 : Published soon..
Siddipet VRA Selection list 2017 : Published soon..
Suryapet VRO Selection list 2017 : Published soon..
Suryapet VRA Selection list 2017 : Published soon..
Vikarabad VRO Selection list 2017 : Published soon..
Vikarabad VRA Selection list 2017 : Published soon..
Wanaparthy VRO Selection list 2017 : Published soon..
Wanaparthy VRA Selection list 2017 : Published soon..
Warangal Rural VRO Selection list 2017 : Published soon..
Warangal Rural VRA Selection list 2017 : Published soon..
Warangal Urban VRO Selection list 2017 : Published soon..
Warangal Urban VRA Selection list 2017 : Published soon..
Yadadri Bhuvanagiri VRO Selection list 2017 : Published soon..
Yadadri Bhuvanagiri VRA Selection list 2017 : Published soon..